The stock is on fire. Here is what the technical analysis on Micron says right now. You might recall that I wrote a piece on Feb. 27 about how Micron is one of the best stocks to own. Well, I took my own advice and bought some Micron shares they they were trading at $47.98 -- a good move, as they're trading at around $60 Tuesday after rallying almost 9% on Monday. Shares got a boost on fresh takeover speculation out of Keybanc. What a beauty Micron's chart has turned out to be in the two weeks since I last wrote about the stock! As you can see, this name has obeyed and even exceeded the support that I projected on Feb. 27. Just look at the daily Moving Average Convergence Divergence oscillator (MACD). Parabolic! Combine that with Relative Strength Index that now stands above 80 on crazy volume and you either have an overbought stock or one where some major news is about to break about the company. 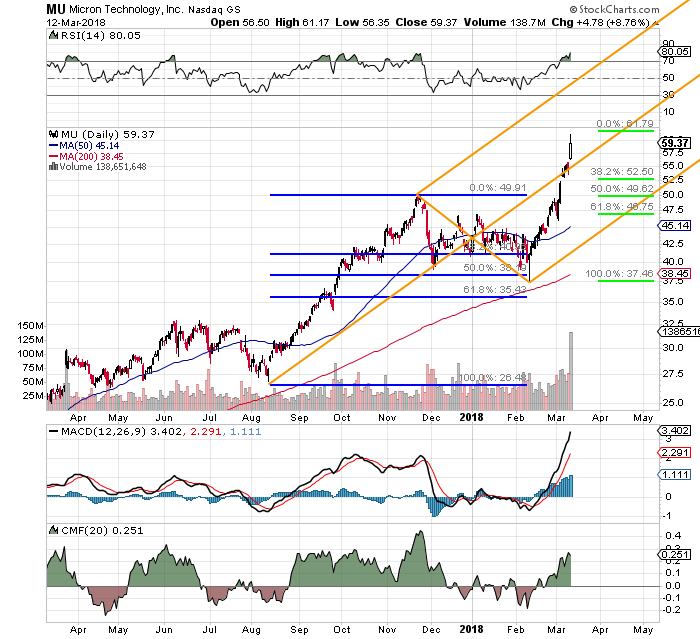 Even if MU reached a short-term peak at Monday's highs, I won't be taking profits at this time. On the contrary, I'm far more likely to add should the stock retrace to the $52.50 area, despite that spot being well above my entry point of two weeks ago. As for those of you still flat the name but looking to get involved, I wouldn't step to the plate with a fistful of capital asking in the aftermath of such a sharp move higher. That's asking to get smacked in the teeth. What you can do instead is write $52.50 puts expiring March 23. Those went for 63 cents Monday night. Why would puts expiring in 10 days with a strike price seven bucks out of the money trade with such a premium? Simple, Micron reports second-quarter earnings after the bell next Thursday (March 22). If you get run over by those, you'll still pay less than a net $52 for Micron shares. A longer version of this column appeared on Real Money, our premium site for active traders. Click here to get great columns like this from Stephen "Sarge" Guilfoyle, Jim Cramer and other experts each trading day. At the time of publication, Guilfoyle was long MU, although positions may change at any time.